On my last vacation in Alaska visiting my friend Bill, we ended up one evening in a dinner theater. Before the show started we had all you can eat crab and we didn't hesitated to eat as much as we could. Very, very yummy. 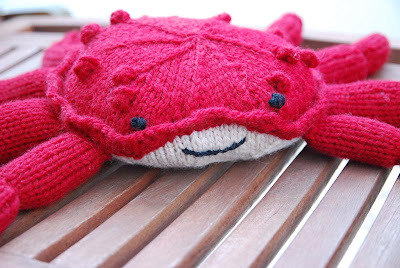 Now, when I saw this pattern on the cover of the last edition of knitty, I knew I had to make it for Bill. 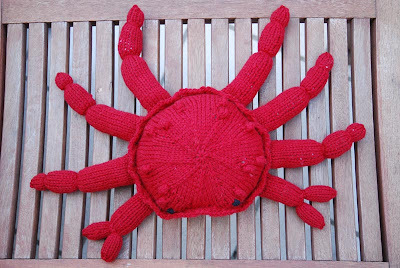 If I may say so, Crabby came out really adorable. I might end up making another one, as it will be very hard to part with him to send him away to Alaska. 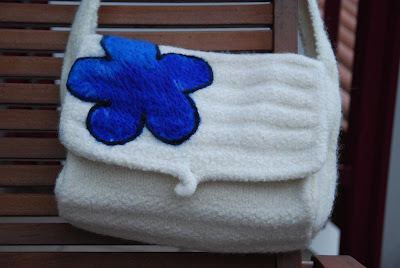 I also tried my hands once again on felting. I think I'm starting to get the hang of it. Two weeks ago I bought five skeins of Rowan purelife - British Sheep Breeds. This yarn is all natural, the only colors available are those nature (and the sheep) provide. Though I had been thinking about another project when I bought the yarn, I later changed my mind and decided on a modular bag. I didn't have a pattern, but found some progress pictures from somebody who had made the pattern before. From there I winged it. Above is the picture before I threw it into the washing machine. Below is the one after. It shrunk from 55cm (21.5 inches) across, the 47cm, which is not too bad. 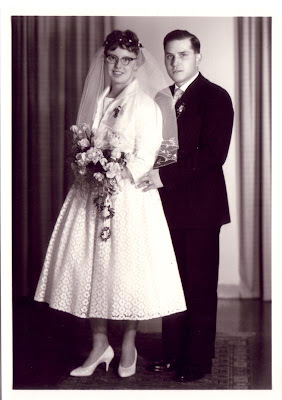 Yesterday, my parents celebrated their 50th wedding anniversary. In those fifty years there have been many ups and downs, and trials and tribulations, but through all of those they stood together. Together, they raised three daughter, enabled them to grow and to find their own way in the world, and for that I will forever be grateful to them. It hasn't been always easy, but I always knew if push came to shove that I always could go to them and ask for their help. I finished one knitting project and started two new ones - at this rate I'll have too many projects eventually. 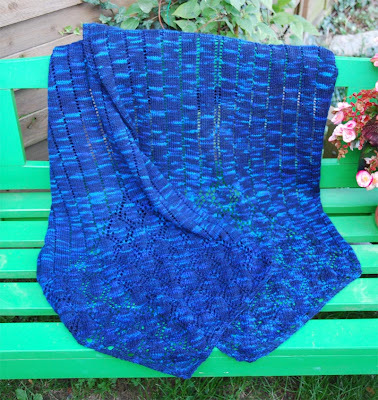 Juno Regina, a shawl I thought about doing for quite a while now. 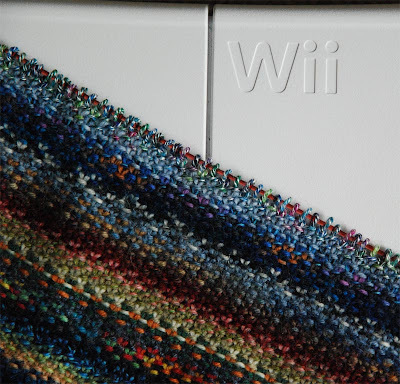 I made it wider than the pattern said because I wanted a wrap and not a shawl, and it worked out quite well. 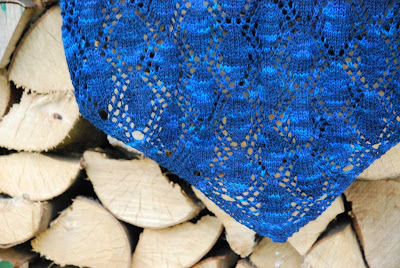 It was a fast and fairly easy knit, even though I realized later that I've made a mistake in the lace pattern on one end - I doubt anybody but me would ever notice, so I don't care. The yarn is Trekking Hand Art, three hanks (about 280g in total). On of the hanks had much less of the lighter blue highlights and to hide that I knitted the middle bit of the wrap alternating 2 rows with one yarn and the other two with the other. I can't see the transition now. 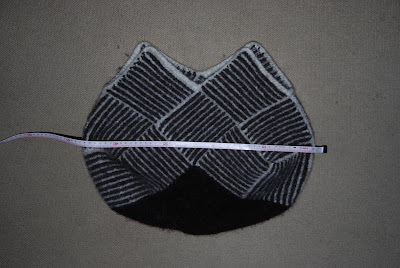 Dimensions are (after blocking) 196 cm long and 49 cm wide. 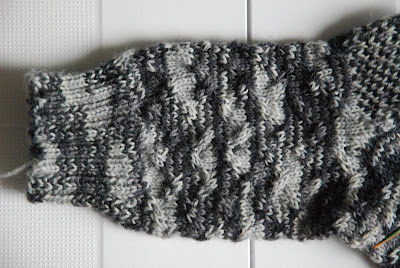 First new start is a sock - easy, portable, in-between knitting. 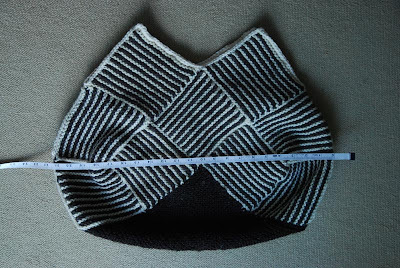 The yarn is rather splotchy, so any lace pattern would have been lost, instead I've got a bit of random cabling going. Second start is a bit longer termed. It's a sleeve cover for my wii balance board. I'm using left over sock yarn (which I have a lot of) and an easy slip stitch pattern, which makes knitting taking twice as long as normally, but looks very lovely with the different yarns. 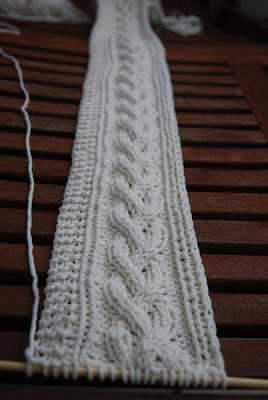 The plan is to knit a 50cm wide and 70cm long piece of fabric and then sew up the sides. I know, there are easier ways to do it, but I've got to use the left over sock yarn for something, right. So far I've got less than 10cm - I mentioned slow going? I've got a week worth of vacation next week, but will spend a lot of the time running around and preparing for my parents' Golden Wedding Anniversary. Nothing much to report on the knitting front. I'm moving forward on the Regina Juno shawl and on the border of the Great American (Aran) Afghan. Nothing too exciting, so no pictures. 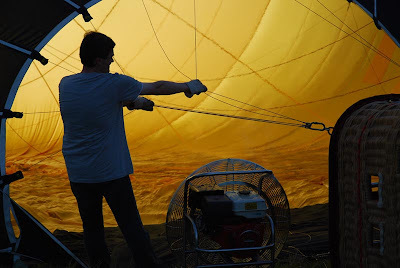 Instead some pictures from Dresden last week, when I was lucky enough to be there when they made two hot air balloons ready to go up into the air. 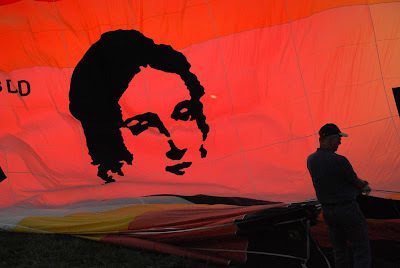 The first balloon is called 'Wilhelmine' - which is the lady in this picture. 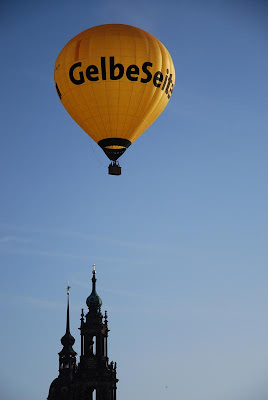 The second balloon was very yellow. And here it's up in the air a minute or so after the start. 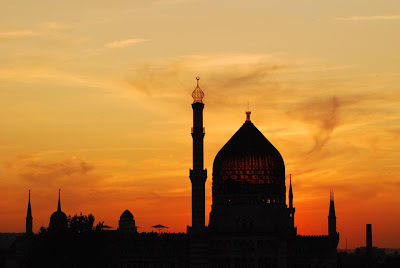 One thing about Dresden is that it's never short of interesting skylines - here's one which most people wouldn't immediately associate with a city in the East of Germany. I thought the white bag from last week looked a bit ... well, too white, so I added a little bit extra to it. The flower is applicated in the needle felting technique. It's fun to do and not very complicated.